← MINGLES/SINGLES COMPETITION by Earl Ball. CD of the FSA. MIXED CHAMPIONS; EARL BALL’S CALL!! So, you think YOU have a strong Mixed Doubles team!!!!! St Pete is going to host the Mixed Doubles Championship as the third Tournament of the season. 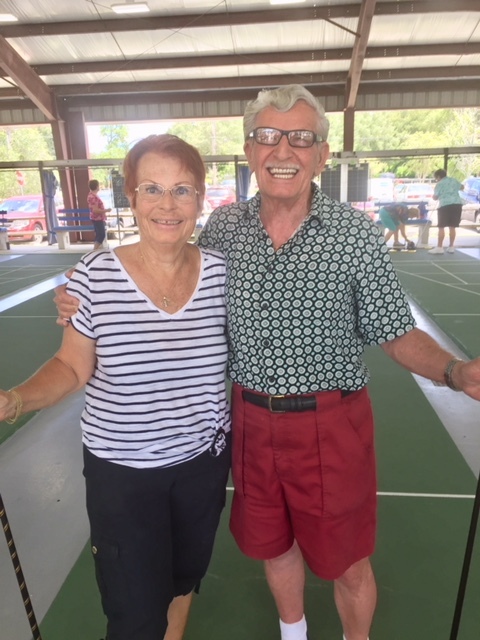 Teams like Ron & Pam Nurnberger, Henry Strong & Glenda Brake, Helen & Steve Biaggi, Dave Kudro & Terry Smith, Earl Ball & Joan Cook, Erik Hahmann & Kerry Bailey, the local favorites among other great teams will be there. But my bet would be on Mike Vassalotti, the best player I haver ever known & Nancy Sclafani, my favorite player and person, to take all the marbles. Great article Earl and after having Nancy S. & Mick V. for a partner this week, you may be right about who may win. Mike V. is a bit rusty after being out of shuffleboard for a few years but he’s making improvements every week. Nancy is just plain great.